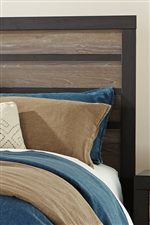 Modern rustic style gives this headboard sophisticated design appeal for your master bedroom suite. The two-tone look pairs warm gray vintage finish with a white wax effect on replicated oak grain with vintage aged black/brown tone framing. This headboard requires a bed frame (sold separately). Headboard legs have four height options for optimal relationship to bedding height. The Harlinton Rustic King Panel Headboard with Two-Tone Plank Look by Signature Design by Ashley at Casa Leaders Inc. in the Wilmington, Long Beach, Torrance, Lakewood, Los Angeles area. Product availability may vary. Contact us for the most current availability on this product. The Harlinton collection is a great option if you are looking for Contemporary furniture in the Wilmington, Long Beach, Torrance, Lakewood, Los Angeles area. Browse other items in the Harlinton collection from Casa Leaders Inc. in the Wilmington, Long Beach, Torrance, Lakewood, Los Angeles area.